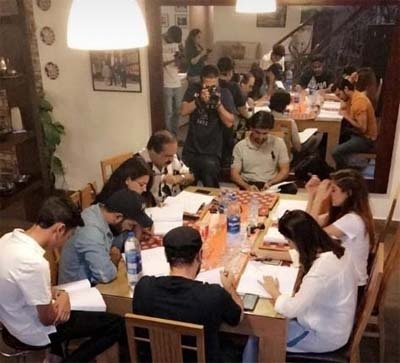 Suno Chanda fever has not even gone and we have been hearing about season 2 coming soon and seems like it wasn’t enough, since we just spotted Farhan Saeed across the table with the team of Wajahat Rauf and Shazia Wajahat’s Karachi Se Lahore 3. Yes and not just sitting, in fact discussing the script. The new sequel to this rom-com is written by Yasir Hussain. People still wonder that Farhan might just be singing a song for the film but it doesn’t seem quite like that since a resource confirmed that he’ll be one of the lead in the movie alongside Kubra Khan. Another exciting news is that the newlyweds Asad Siddiqui and Zara Noor Abbas will also be a part of the movie with best friend Yasir Hussain. Another couple in the movie will be Ayesha Omer and Shahzad Shaikh. Karachi Se Lahore 3 is hitting the theaters Eid ul Fitr 2019. We are super excited for this multi starrer rom-com. What about you?